Way With Worlds is back for round two! We love making fictional worlds - but making ones that are memorable and powerful takes work. How can we build better fictional settings when there's so many challenges? 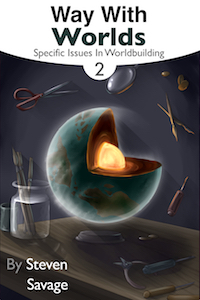 To help you out, author Steve Savage dives into specific issues and subjects that are important to worldbuilders. It's time for a deep dive on subjects near and dear to our hearts - and occasionally frustrating! Heroes, Villains, and Author's Pets - Good and evil are tough enough to write, but get more complicated when author's favor certain characters, or our own cultural biases step in! Utopias and Dystopias - How do we make believably good civilizations, believably bad ones - and why do we do this in the first place? Conflicts - How do conflicts occur, how can we write them realistically, and what happens when you need to haul off and go post-apocalyptic on your setting? Communication - How do you tell people what's going on in your world, without making it obvious you're telling them? Tools and Techniques - From philosophy and exercises to using (or avoiding) other forms of media to help your worldbuilding, what can you do to stretch yourself? Skills - What skills make a good Worldbuilder - and is worldbuilding itself a skillset or something more? Originality - Fruitless quest or the holy grail of the worldbuilder? Why do we worry so often about originality? Whether you're an experienced creator or just starting out, Way With Worlds is your helpful guide to making better fictional settings for you and your audience! Be sure to check out the first Way With Worlds Book!